TheProspectorDaily.com publishes breaking news, sports and entertainment stories, blogs and multimedia projects daily. Your advertising and promotions will be available to potential clients 24/7 wherever they are and wherever they go. These two ad spots will not be shared with any other advertiser. Copy for online advertisements is due 5 days prior to date it is scheduled to go live. 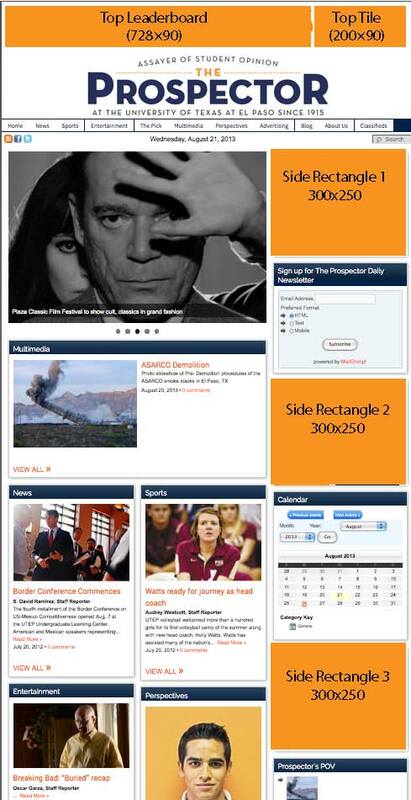 Up to 3 advertisers can rotate throughout the site pages in each Side Rectangle ad spot. Ads can be sold on a per week, per month, or per year basis. Ask your Account Executive for details.